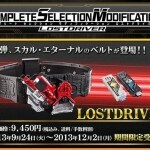 Hot on the heels of the Lost Driver comes W’s seventh memory- FANG! This rare Gaia Memory gadget allows W to transform into FangJoker when used with the previously released W Driver (sold separately of course). Complete Selection Fang Memory will be released in December for 6300 Yen. Orders open at the end of the month! 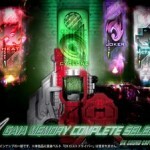 After several early teasers, Bandai’s official site has put up a complete page detailing the Complete Gaia Memory Selection, a superb recreation of the powerful Memory devices found in Kamen Rider W.
Bandai has released additional info for the New Gaia Memory Complete selection set that was previewed sometime ago. At the time, only memories from Kamen Rider W’s novel were known to be included, but now the set will now contain over 99 Gaia Memories which were featured in W’s various films! 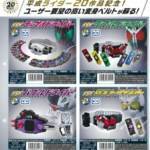 Memories from Kamen Rider W Returns, W & Decade Movie War, and the Gaia Memories of Fate will be featured in the set. in addition, six Gaia memories will remain a secret. Additionally, the set will once again be releasing W’s main six Gaia memories. But what makes these memories different is that they will include LEDs and the buttons will be painted silver to make them more show accurate. 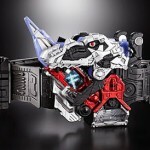 In addition, the Heat and Trigger memories will be able to make the Twin Maximum sound effect. More information on this set be posted on July 31st. 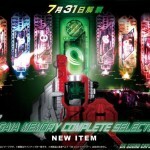 New Gaia Memories to be Released! It’s been almost 2 years since Kamen Rider W’s end, and it seems as though Bandai isn’t done with Gaia Memories quite yet. Fourze, PuToTyra Combo, Decade Complete, Kabuto Hyper, Hibiki Armed, Blade King, Kuuga Ultimate, V3, X, Skyrider, ZX, Black RX, and ZO. 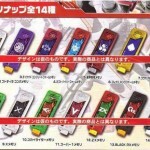 Wizard, Fourze Cosmic States, Kiva Emperor, Den-O Liner, Faiz Blaster, Ryuki Survive, Agito Shining, Rider #1, Rider #2, Riderman, Stronger, Black, Shin, and J. So far, no word on the pricing, release date, or release method has been announced. Thanks to Tokunation member PkmnMstr for giving us the heads up!